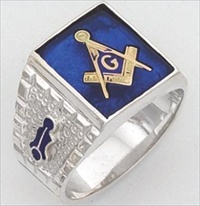 ORDER YOUR JESTER RING HERE NOW! Priced as 10K, OPEN BACK, with a 1CT CZ. Add a genuine diamond or add a Moissanite stone. Diamond prices quoted below are for diamonds SI-1, H to I in color. For diamonds of a different grade, please contact us for a quote. Choose your size and whether you want a solid back or open back ring as well as 10K or 14KT Gold. 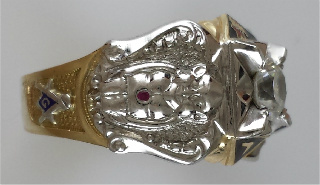 Ring #1 shown has the Shrine panel on one side of the shank and the Bilikin on the other. 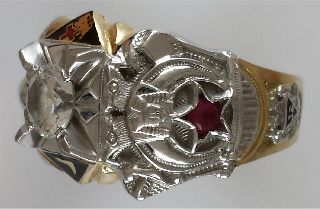 The Shrine emblem has a synthetic ruby mounted in the star and the Bilikin has a synthetic ruby in his belley button. 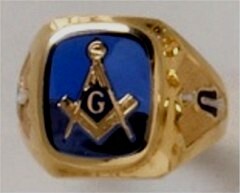 Underneath the Bilikin is the Blue Lodge Compass and Square and under the Shrine emblem is the 32nd Degree Double Eagles. 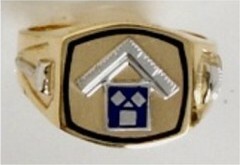 On top is the 14th Degree Triangle and the York Rite Crown and Cross is on the other side. Go with the CZ as priced or add a genuine diamond or Moissanite stone. 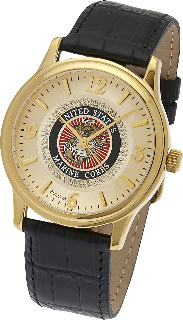 The workmanship on this ring is second to none. 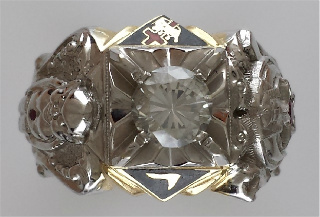 This ring will accommodate up to a 1.5ct stone. 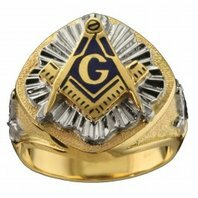 Made of 10K or 14K with an open or solid back, this is an absolutely beautiful ring; one that can be passed down to future generations for many years to come. Approximately 11/16th inch wide.